The first statement “Actions are but by intentions” does not negate actions in their essence if they were not based on an intention, but negates their validity e.g. if you wash your whole body but did not have the intention of ghusl, then you have not performed ghusl i.e. your ghusl is not valid, though it cannot be denied that you washed your body. Al ‘izz ibn Abdissalam explained this by saying: The first statement deals with validity of actions, while the second statement deals with what is based upon this action i.e. reward. As this hadith is an important hadith, it will be mentioned many more times in Sahih Bukhari, and in each time it is explained from a different angle so there is much more to say on this hadith but that will be deferred to when we come across it again in Sahih Bukhari. 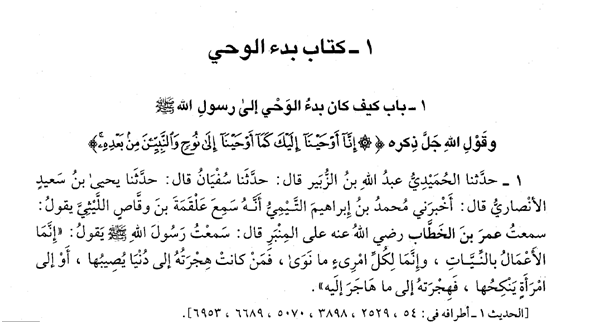 You can also see the commentary on this hadith from the 40 hadith commentary page.